Boom is a large, obese, meditating pig creature who is the second and eighth boss of Game B of Round Mode in the Nintendo Entertainment System version of Wario's Woods. He first appears in the nineteenth round of the game. Boom's artwork depicts him to having horns and to wearing ragged clothing. 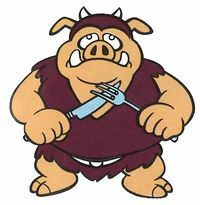 He also sports a fork and knife combination which may be in reference to his gluttonous nature. Toad, the main protagonist of Wario's Woods, needs to hit Boom nine times with bomb explosives in order to defeat him. In Toad's first encounter with Boom, he can creates enemies at a rapid rate by meditating. He crosses his legs and floats in the air. In his second encounter, Boom can create enemies at even a faster pace. Boom can also throw around the enemies around the stage which adds to his ability to form monsters through meditating. Boom (like the other bosses) is also capable of re-locating himself and if he is to re-materialise near Toad, he would cause the hero to instantly lose the battle. De Bū Portmanteau of "fat" (デブ, debu) and a pig's oink (ブーブー, Būbū). This page was last edited on January 30, 2019, at 19:15.